I ask all my couples to send me a wedding invitation so that I have one on hand the day of to photograph with all their other wedding day details. When one of my June wedding invitations came in the mail I noticed that they had personalized stamps with an anchor, their wedding theme, and wedding date from zazzle.com. I loved the extra signature detail and wanted some for Cassandra Henri Photography. I was impressed with the quality and timeliness that they were delivered in. I'd definitely recommend zazzle if you're looking for personalized postage for your own mailing wether it be a wedding, birth announcement, Christmas card, birthday invitation... any type of snail mail you like! My favorite gifts to give around the holidays are homemade ones. They make for a fun project for me, are one of a kind as a present, and show thought and care. This year I've made a few sets of glittered glasses to give as gifts. I bought the gold lipped glasses at The Dollar Tree and the rest of my supplies at Michael's. WHAT YOU NEED: 4 glasses, Martha Stewart Multi Surface coarse glitter paint, a paint dauber, patterning tape, and rubbing alcohol. STEP 1: Clean glasses with rubbing alcohol. Let sit dry. STEP 2: Place detailing tape on glass as desired. I choose to use two sizes of tape and place lines on the glasses close to each other near either the upper middle or bottom of the glass. Two glasses with lines at the bottom and two with lines at the upper middle to add variety to the set. STEP 3: Add glitter paint by dabbing it onto the glass. I went for a fading effect with the most concentrated part of the paint between the two pieces of tape and fading out as I dabbed the paint away from the tape. NOTE: Keep the paint an inch below the lip or the glass at it shouldn't reach anyone's mouth when drinking from the glass. STEP 4: Let dry for one hour and then add a second coat. STEP 5: Let dry one hour and remove tape. I'm a big ol' fan of DIY projects that are inexpensive, don't take a whole lot of time, and are -of course- pretty. Joining the wedding industry has opened my eyes to many more levels of the pinterest-sphere and the DIY possibilities are endless! 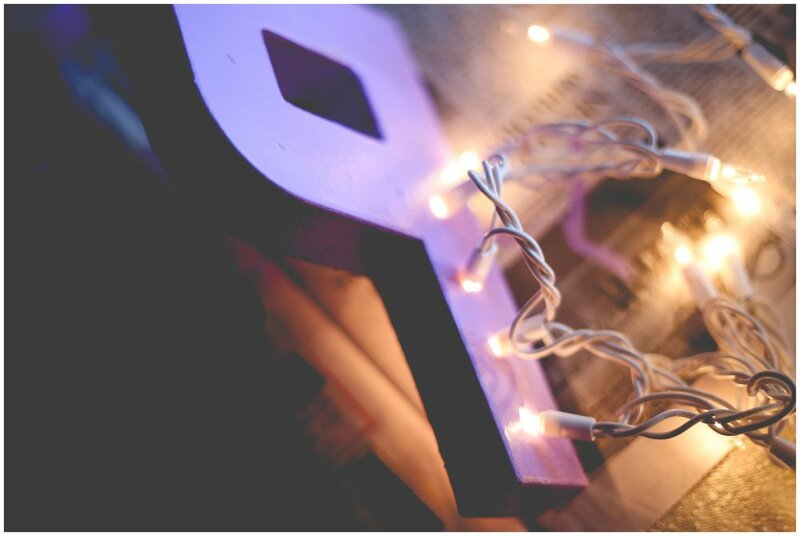 One trend that I saw and instantly fell in love with was the use of Marquee letters at weddings or as props in sessions. I made a set of my own and fulfilled a life long dream of seeing my name in lights. I love sharing my DIY adventures so you'll find a brief tutorial below. This is a super easy idea, but I think it could add something really special to your event or session. Make sure to follow me on PINTEREST to see what else inspires me! What you'll need: Cardboard letters, paint, paint brush, exacto knife, pencil, lights. STEP 1: Use exacto knife to cut off the front piece of each letter. STEP 2: Take out the cardboard inserts from each letter. STEP 4: Use a pencil to draw evenly spaced dots on the back of each letter. STEP 5: Use exacto knife to cut an X over each pencil mark. STEP 6: Punch white lights through the Xs.